Friends, family, food and wine were always reasons to celebrate when Jim Valvano came to dine. Jokes were shared, times reminisced, friendships immortalized. It seemed only natural to name the restaurant after the dear friend who started the tradition that Jimmy V’s continues today. 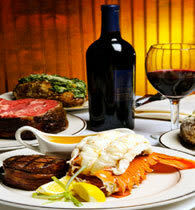 Jimmy V's Steak House offers four different menu packages for sit down dinners and also offer heavy hors d’ oeuvres for cocktail events.